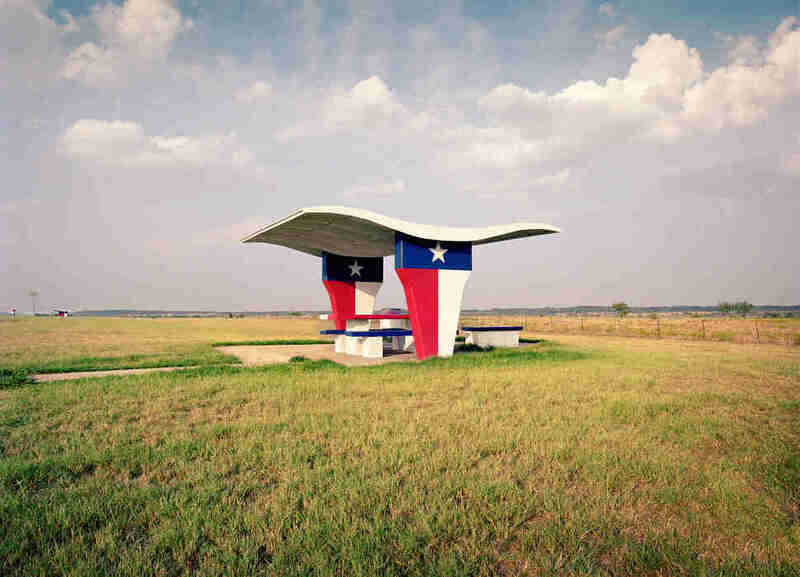 Highway rest stops might be our most underrated piece of Americana. They celebrate our vast country's freedom of movement, each one designed with a unique little nod to whatever place we happen to stop in. The best rest stops were not always designed as food courts crossed with jumbo convenience stores. 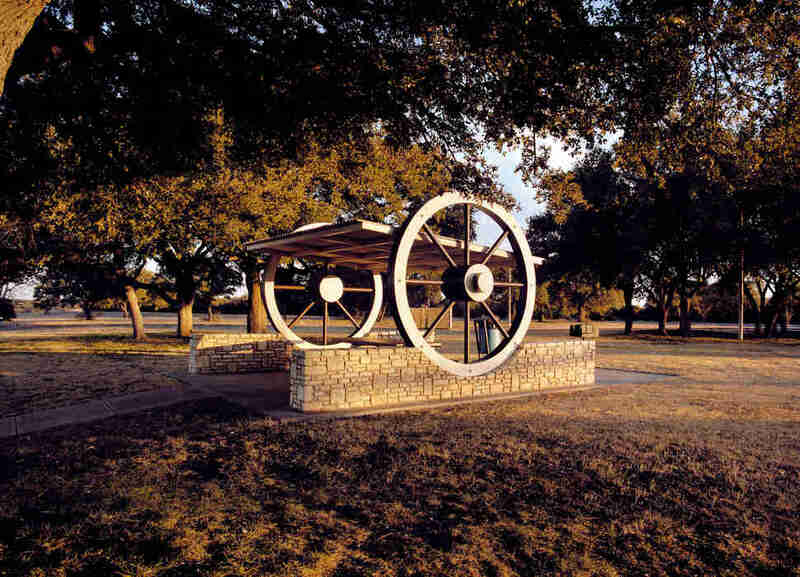 Once upon a time, you might pull off a Texas highway for a picnic under a shelter shaped like longhorns. Today, you're more likely stop at something that looks like a shrunken mall outside Orlando to pick up the same Frappuccino you can get in Dubuque and maybe a Lightning McQueen keychain. And then forget you were ever there. A century ago, of course, road trips were a bit weirder. When the US first built its expansive system of highways in the 1920s, rest stops were simple safety areas designed for motorists to take much-needed rests (the distances weren't longer back then, but the cars were sure slower and the roads less sleek). By the 1930s, the Civilian Conservation Corps turned them into full-on roadside parks. The post-war interstate era brought with it rest stops designed to make the driver feel like a part of the local environment. Tables were set at strategic viewpoints, and restrooms designed to reflect the surroundings. Stops at these unique rest areas became as much a part of the American road trip as fast-food lunches and the license-plate game. 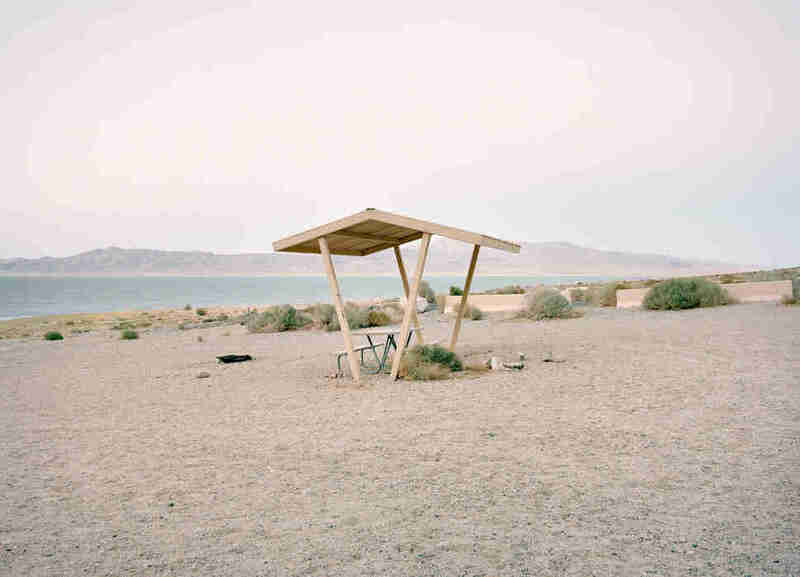 This was the rest stop that inspired the project. 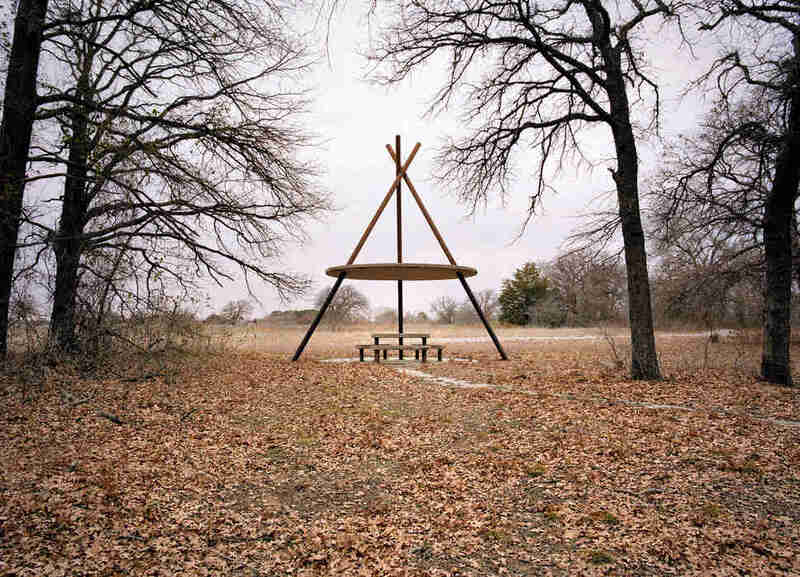 As I researched rest stops to see what was beyond the Austin area, I was excited to find a photo of this rest stop, and then shocked to read it would soon be demolished. The next weekend I drove four hours north to shoot it. Sure enough, it was demolished a few weeks later. This is by far my favorite location. The picnic tables there are iconic, straight out of the ’60s, and the landscape is like no place else on Earth. It was a hot summer day at sunset when we were shooting, and a thunderstorm had just rolled through, so hardly anyone was around. You couldn’t take a bad picture in this place. For years I had seen photos of this stop online, but never found myself in East Texas to photograph it. It was nearing time for the book to go to press, and I realized that I still hadn't photographed this stop. I planned a day specifically to head north, just to shoot it. We drove up from Austin, and arrived around sunset. There wasn't a soul around. This is one of the most unique and fun designs within the rest-area system. 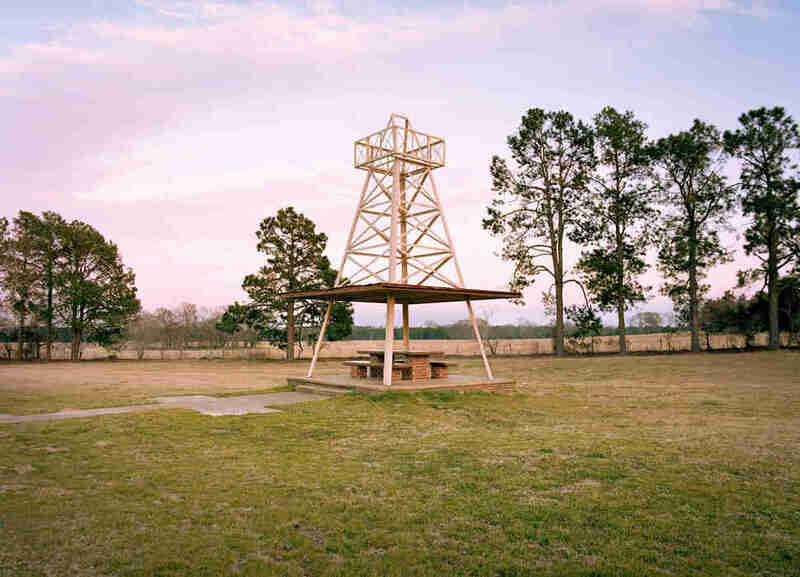 Regionalism was often used during the design of these stops to define the places travelers passed through, such as this oil derrick-themed rest stop, located in the middle of oil country. 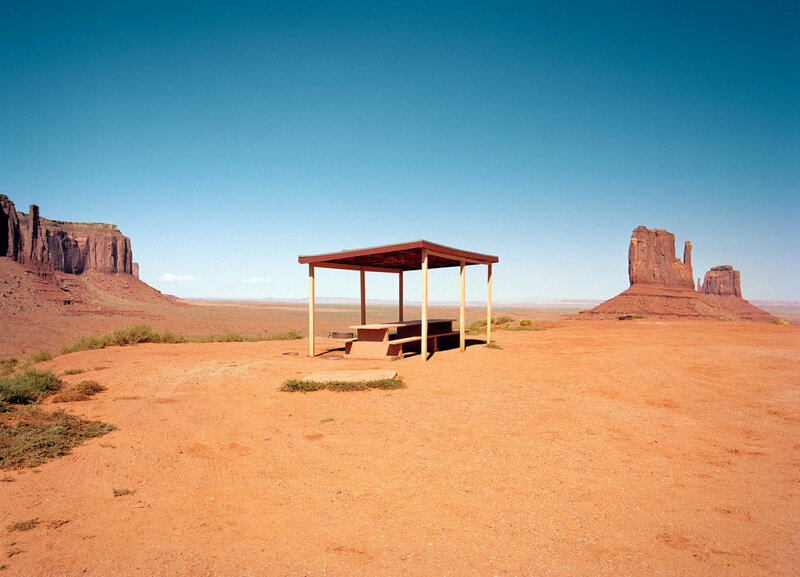 This is one of the most remote rest areas in the country. 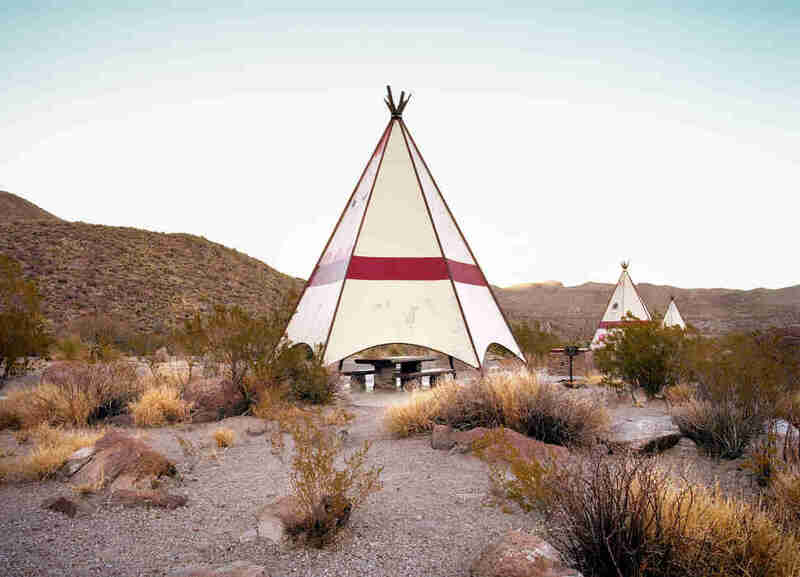 These teepees are hidden just outside Big Bend National Park, right on the Rio Grande, which divides the United States and Mexico. As we were shooting, a pack of javelinas ran by. This was a spontaneous find, and I was thrilled to stumble upon it. Before heading out on a trip, I do a lot of research, referencing sites such as Google Images and Flickr to find interesting rest stops across the country, and then usually plan a trip around a dozen or so of those stops. Occasionally, however, I'll stumble upon one that I didn't know existed. We were done for the day and heading into Las Cruces to find a hotel for the evening when I saw a sign that read "Rest Area -- 1 Mile." We took the exit and found these beauties high atop a hill overlooking Las Cruces. It also happened to be sunset, so it became a perfect storm. This is also one of my favorite images from the book. 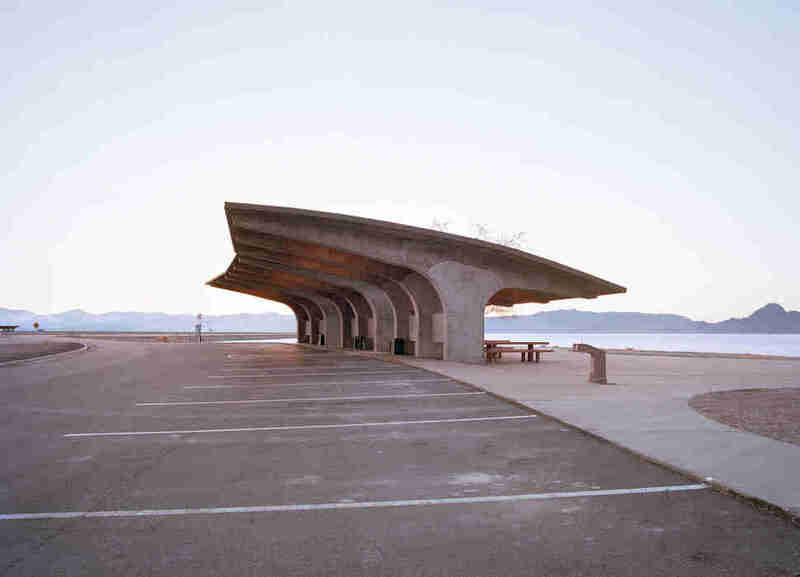 This is one of my favorite stops in the book, and another example of one of the most unique rest-stop designs within the Interstate Highway System. 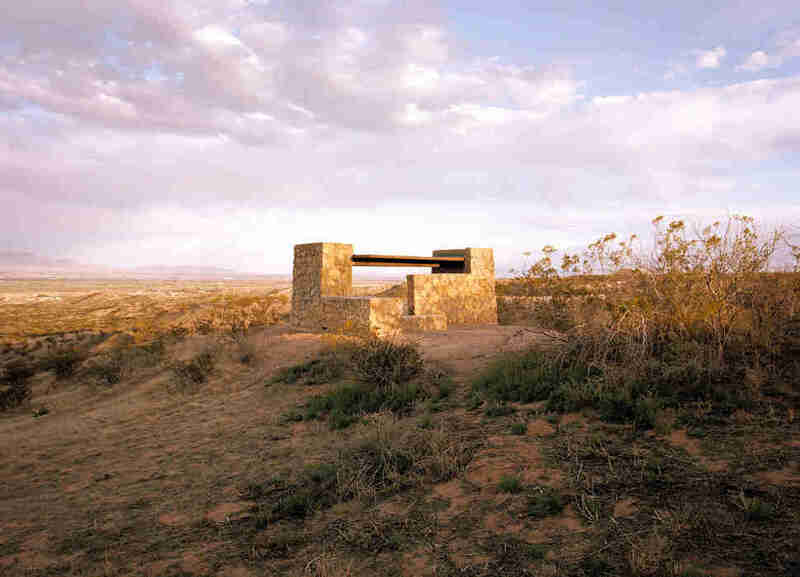 This stop is located along Interstate 10 in West Texas, and is a nod to the pioneers that settled this area. 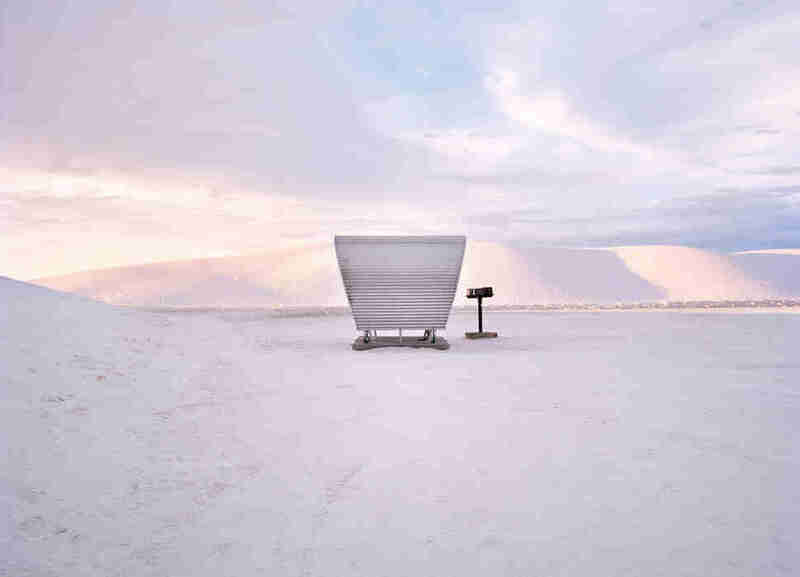 Many of the rest stops within the US showcase unique and dramatic examples of regional and modern design. 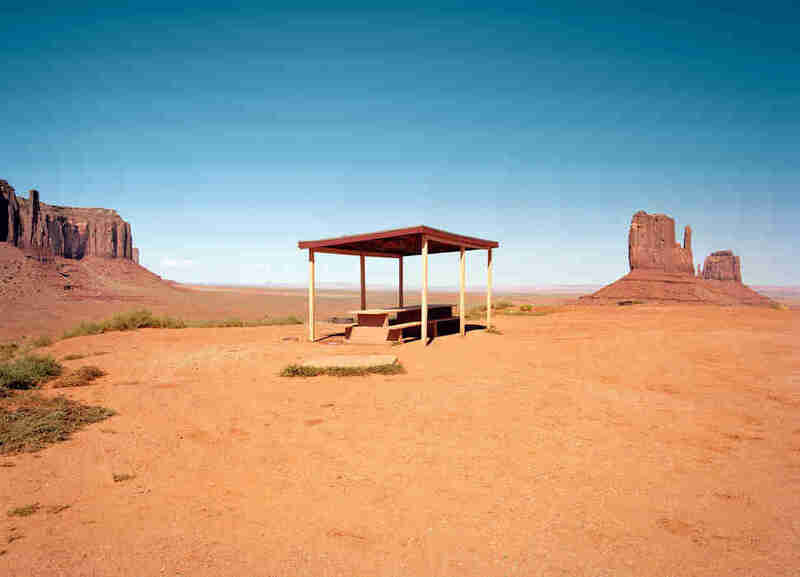 This is one of the last picnic tables in Monument Valley. There were many more, but the rest were demolished so that a hotel overlooking the valley could be built. 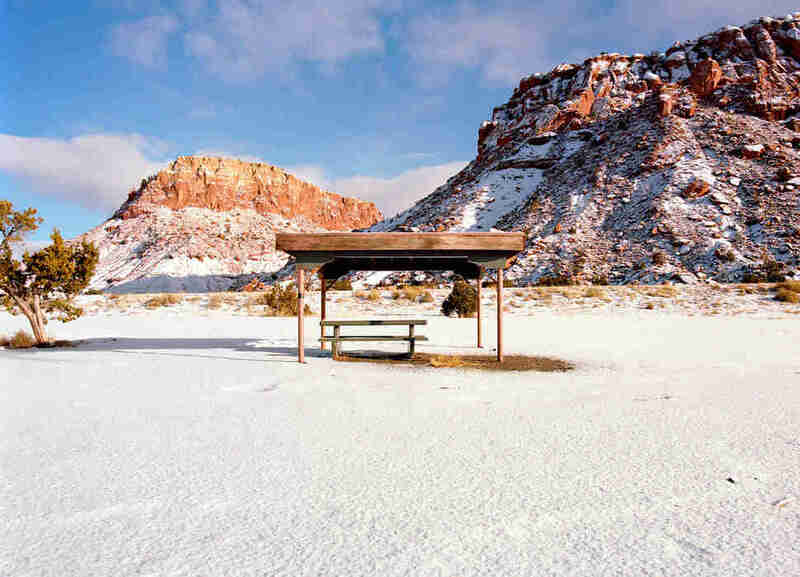 This table is located in a pull-off, offering a great view of "The Mittens" rock formations in the background. Shortly after arriving here, we started noticing an unusual prevalence of very large spiders. Actually, they were everywhere. It was so strange and creepy that we Googled it, and sure enough, news articles detailed the freakish "spider infestation." This stop was closed and fenced off, but we found a farm road just past the rest area that took us around back. It looked like it had been closed for years; some of the giant oaks had fallen on a few of the teepees, and it was winter, so the trees were bare. This was another favorite. Since beginning the project years ago, this had been at the top of my list to shoot. Once I found out that the book was a go, I made a special trip to Utah just to shoot this stop. The salt flats were magical. This has got to be one of the most incredible places in the country. I was driving back to Texas, after being in Colorado for Christmas, when I passed this stop. We were the first ones to stop there since snow had fallen overnight. Matt Meltzer is a staff writer with Thrillist who is now inspired to put some rest-stop photography on his Instagram: @meltrez1.